Most investors want to sell properties outright. They hope for a clean, quick transaction. But for many, it’s just not happening. Rent-to-own sales, or lease options, are moving into the mainstream, according to Robert Eisenstein with HomeRun Homes, an online classifieds website dedicated solely to rent to own transactions. The benefits of rent-to-own for tenant/buyers are obvious: the chance to scope out a neighborhood before buying, and getting into a house without having to apply for a bank loan. Apportioning the lease option payment in each month’s rent payment also forces buyers to stick to a budget. But the advantages for sellers are more subtle. “For sellers, it’s a matter of being stuck with a property they can’t move in this sluggish market,” explains Eisenstein. Selling rent-to-own is not for everyone. But it does work for those investors who need to do something rather than sit on a vacant property. A rent-to-own contract gets the property off the market, and gets someone in there that can watch over the property. Then, it’s a matter of wait and see if the market improves, and whether the tenant/buyer remains motivated. Not all markets are the same when it comes to rent-to-own. HomeRun Homes sees a lot of action in Atlanta, Central Florida, North Carolina, California and Chicago. “That’s because of the severe decline in home prices in those areas, coupled with a rough economy that poses credit hardships on many buyers. Many are self-employed or cash business buyers that can’t get credit. 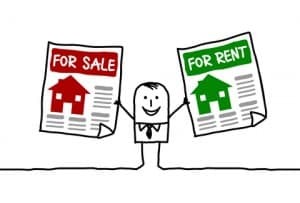 In fact, selling rent-to-own offers the opportunity for the landlord/seller to help the buyer rehabilitate or create credit over the term of the lease, by offering rent and lease option payment receipts and reporting the steady payment history to credit bureaus. For these transactions to succeed, it’s important for investors to carefully evaluate the tenant/buyer. For instance, find out why they are looking for a rent-to-own, rather than buying a home. Also, consider the applicant’s time frame for purchase. While most lease options run at 12 months, some go for as long as 36. The longer the term, the harder it is to agree on a purchase price. It is also important to look at the applicant’s residence history — whether they have been renting or recently lost a home, for instance. In some cases, the seller may be able to offload some of the maintenance of the property. Rules vary from location to location, so it’s best to work with an attorney in developing your rent-to-own contract. It you want to learn more about rent-to-own, HomeRun Homes offers investors information on its website and blog, a newsletter, and an e-book entitled, Secrets of Rent-to-Own. They provide a highly-ranked online classifieds service matching properties to buyers/tenants.